Our resident minister, Reverend Shinkai Murakami, was born in Fukuoka, Japan. Rev. Murakami joined the Honpa Hongwanji Mission of Hawaii on December 1, 1985 and is one of its senior ministers with 28 years of experience. Prior to being assigned to Wailuku Hongwanji, he served as associate minister of Hilo Hongwanji (1985-1988), resident minister of Kapaa Hongwanji (1988-1995), and resident minister of Pearl City Hongwanji (1995-2004). Rev. Murakami has accomplished much during his previous assignments. He helped to reorganize the Japanese Language School and was appointed to the board of the Hawaii Japanese Language School Association in 1988. During his term at Kapaa Hongwanji, Hurricane Iniki hit the Island of Kauai on September 11, 1991 and caused widespread damage. With temple members and supporters, he helped to rebuild Kapaa Hongwanji’s temple, social hall, and parsonage. 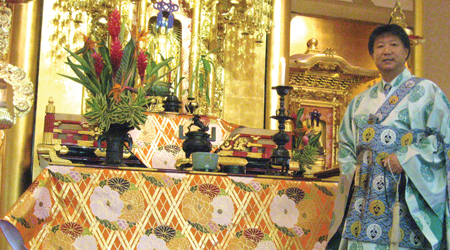 During his tenure at Pearl City Hongwanji, he increased temple membership and participated in community activities. Such activities included joining the Interfaith Chaplain program, taking their classes, and serving as volunteer chaplain for a hospital. In July of 2004, Rev. Murakami was assigned to Wailuku Hongwanji. 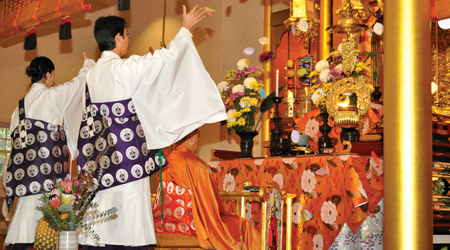 During his tenure at Wailuku Hongwanji, he participated in the temple’s 105th anniversary in 2004 and 110th anniversary in 2009. He has been instrumental in increasing temple membership by recruiting more than 12 new members every year. As the principal of the Japanese Language School, he has implemented new programs that have increased student enrollment to over 90 students. New programs include culture days and educational trips to Japan. In 2012, the Honolulu Japanese Chamber of Commerce presented him with an award to recognize his efforts with the Japanese language schools throughout the State. In addition, he has been involved with planning and implementing temple improvement projects. Examples of such projects include the handicap accessible ramp between the main temple and the columbarium at the rear of the temple, the elevator from the ground level to the columbarium, and expansion of the columbarium and refurbishment of its altar for the temple’s 110th anniversary. He has also advised Eagle Scout candidates from Troop 40 to take on temple improvements projects. In 2011, he organized a committee to prepare a cookbook, A Taste of Dharma, to raise funds for the temple’s Vision 2030 program. The cookbook was an overwhelming success with the publication and sale of 1,500 copies in 2012. Besides working with the temple, Rev. 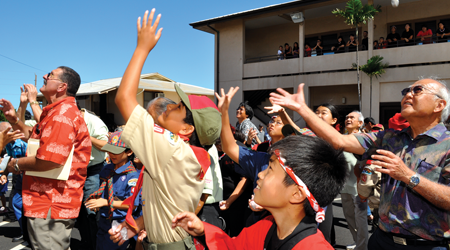 Murakami is involved with State Hongwanji, Maui District Hongwanji, and community activities. On the State level, he is a member of the Honpa Hongwanji Mission of Hawaii Bishop’s advisory committee and president of the Hawaii Japanese Language School Association. On Maui, he is the head of the Maui District Hongwanji ministers, advisor of the Maui Hongwanji youth program, and a member of the Maui Interfaith Ministry. He assists many community programs and organizations, and was recently installed as the president of the Japanese Cultural Society of Maui. Wailuku Hongwanji Mission is fortunate to have an experienced, hard working resident minister. Monday - Friday: 7:30 a.m. to 12:30 p.m.